Bitcoins, yes this is one of the most trending terms currently on the Internet. You must be wondering what it is and how why its value is increasing day by day. What is Bitcoin? Well, according to Wikipedia, “Bitcoin is a cryptocurrency and worldwide payment system. It is the first decentralized digital currency – the system works without a central repository or single administrator. This is currently one of the most frequently asked questions. While there’s no doubt that this investment is all about taking the risk, the current scenario is really strong and is growing day by day. That is, if you would’ve spent 100 USD or 6000 INR in 2010 in Bitcoin, you could’ve been a billionaire by now. Take a look at the chart below and decide yourself. Now while you are thinking to invest some money in Bitcoin, you might be thinking to ways to earn Bitcoins for free. In this article, we will provide you with a simple trick to get free bitcoins without investing a single money. 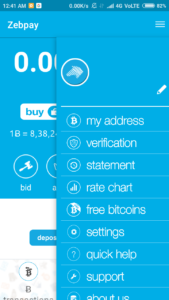 Download the Zebpay App on your Smartphone. It is available for Android and iOS. This is currently India’s leading genuine Bitcoin wallet. Install the application and complete the Sign-up procedure. Simply verify the Phone Number, Add a Security PIN and finally your Name. Other remaining info isn’t required at the moment. Now, tap on the 3 Lines on the top right to open the side menu. 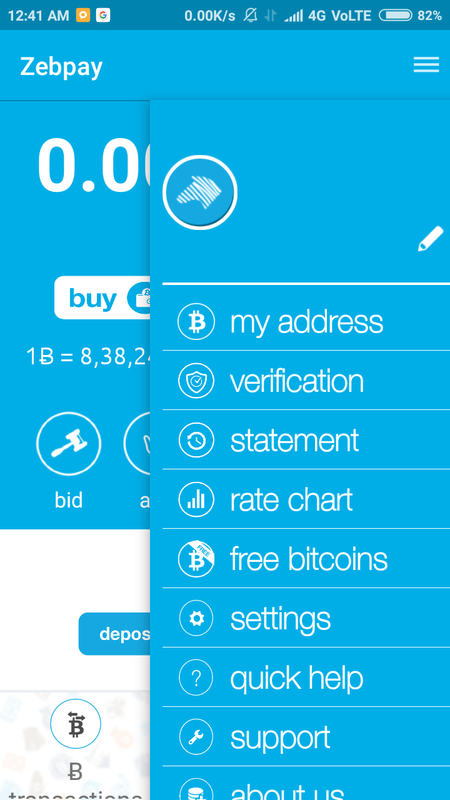 Tap on “free bitcoins” label. Click on “verify” button . 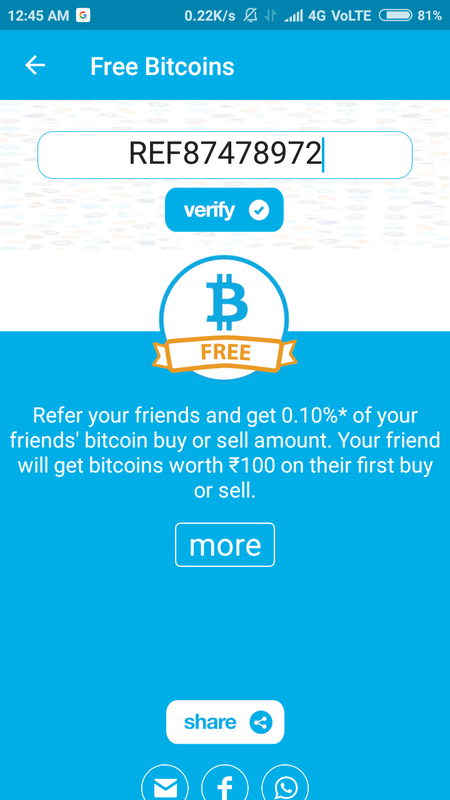 The promo code will be instantly applied to your account and you’ll receive free bitcoin worth INR 100. 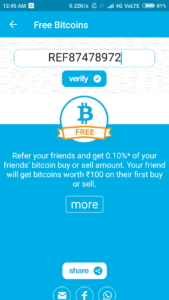 To earn more free bitcoins, share your exclusive referral code to your friends. To deposit or invest the money in Bitcoin through Zebpay, simply complete the remaining verification process by adding your PAN Card, Aadhar Details and your Email Account. You can sell and withdraw your amount anytime to your bank account without any restrictions.